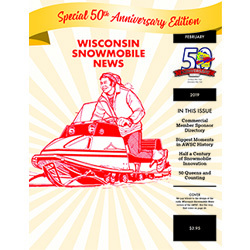 February 2019 - Midwest Sports Publishing Network, Inc.
Fertile, MN (February 24, 2019) – Nestled against the shores of Lake of the Woods in far northern Minnesota, Warroad has played host to various cross-country snowmobile racing events over the past two decades. The town and its surrounding terrain make a perfect setting for cross-country, with woods, ditch, shoreline and plenty of snow. With eight inches of fresh snowfall and poor visibility, officials pushed back the start to 10:30 A.M on Saturday and also adjusted the race to a one day event due to the weather. Zach Herfindahl has been the rider to beat on the USXC cross-country racing circuit in 2019. Fresh off his win of the two-day Goodridge/Grygla 500, Herfindahl has a comfortable points lead with just four events left on the schedule. 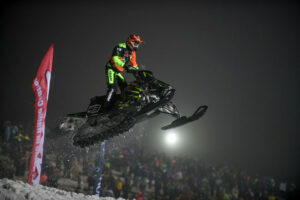 After a disappointing DNF in Pro Open, Herfindahl came back to claim 2nd place in Pro Factory 600, the premier class on the circuit. New to the Christian Brothers Racing team in 2018-2019, David Brown has been steadily climbing in the race results in Pro Factory 600 and Semi-Pro Factory 600. At Warroad he had his best weekend so far in his main class, Semi-Pro Factory 600, taking second place. Brown also claimed an 8th place finish in the Pro class, showing he has the speed to run in the top class. Next up for Christian Brothers Racing cross-country riders is the Naytahwaush 100 March 2-3 in Naytahwaush, Minnesota. For more information on Christian Brothers Racing visit www.christianbrosracing.com. Follow Christian Brothers Racing on Facebook, YouTube, Twitter and Instagram. Hutchinson, Minnesota – C&A Pro, a leading manufacturer of high performance snowmobile skis, is adding Purple, “Lime Squeeze” and Teal to its color lineup. These hot new colors were added by popular demand to complement the latest Arctic Cat®, Polaris® and Ski-Doo® sleds. Learn more about C&A Pro high performance snowmobile skis at www.caproskis.com. For nearly three decades C&A Pro Skis have dominated the high performance snowmobile ski market. No other snowmobile ski has set more records and won more races than C&A Pro. C&A Pro Skis is a division of Pride Solutions LLC, a family-owned American company in Hutchinson, Minnesota. The product is proudly made in U.S.A. and sold worldwide through powersport distributors and dealers and online atwww.caproskis.com. The C&A Pro Skis tradename is owned by C&A Pro Skis LLC and is exclusively licensed and manufactured by Pride Solutions, LLC. Learn more about C&A Pro at www.caproskis.com or call 1-888-321-6789 or +1 320-587-7707.